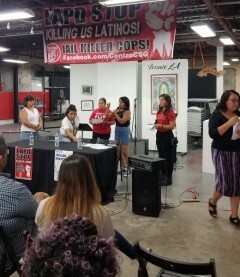 Annual Boyle Heights Chicano Moratorium event unites with teachers of UTLA | Fight Back! Los Angeles, CA - The featured speaker at this year’s commemoration of the historic 1970 Chicano Moratorium against the War was United Teachers of LA (UTLA) chapter chair at Marvin Avenue Elementary School and longtime Centro CSO member Lupe Torres. Torres spoke of about the bad conditions in LAUSD schools, including low funding, high student teacher ratios, lack of support staff like counselors and nurses, and the unfair pay for public school teachers. Torres pointed out how private charter schools come to the Boyle Heights neighborhood, taking away students and funding, leading to a crisis in our public schools. Torres said members of the UTLA took a strike vote, with 97% voting to approve a strike against LAUSD, the nation’s second largest school district. Centro CSO is a strong ally of UTLA and will stand in unity if a strike takes place. The Chicano Moratorium event was attended by many union members and leaders, including Dalia Jaramillo, Vice president of SEIU 1000, members of International Machinist Union and local Teamsters. Mendez High School students, local families and many others filled the house at the Chicano art center, Self Help Graphics, August 29, to commemorate the 48th Chicano Moratorium Against War. The event was organized by CSO: Community Service Organization, which is based in Boyle Heights. The Chicano Moratorium is held every year to commemorate the Chicano Liberation Day and the ongoing fight for self-determination. Raul Ruiz, former editor and photographer for La Raza newspaper spoke as an eyewitness to the killing of Ruben Salazar, the prominent journalist who as killed by LA sheriffs during the 1970 Chicano Moratorium protests. Gloria Arellanes, a founder of the original Chicano Moratorium, Brown Berets and Las Adelitas - an anti-war woman’s group spoke, of the history of fighting U.S. wars. Also speaking at the event was Sol Marquez-Freedom Road Socialist Organization, who talked about the right to self-determination for the Chicano Nation, and Carlos Montes of Centro CSO, who called for organizing in our barrios to fight police killings, legalization for all, support for public education and public unions like UTLA, as well as showing solidarity with oppressed nations of the world fighting for freedom from U.S. imperialism. Join Centro CSO for their public meetings the third Wednesday of every month 6 p.m. at Benjamin Franklin Library. Look for /Centro CSO on Facebook and Twitter.